Virtual reality devices have exploded in popularity among tech fanatics and media fans, but the virtual world is still new for many people. Virtual reality is a computer-generated environment accessed through an immersive device – like a headset – that allows a user to fully engage with an alternate, generated world. In virtual reality, the generated environment is completely separate from the physical world, catering particularly to complex media like films and video games. Like virtual reality, augmented reality is a way of connecting with an enhanced environment. However, where virtual reality seeks to completely replace our world, augmented reality simply adds layers onto it. This way, people can still interact with their physical environment while gaining additional information from their augmented reality devices or applications. Virtual reality is typically accessed through a headset. This way, the real world can be completely blocked out and replaced by the generated environment. Because the user does not need to interact with anything “real,” there is no need for augmenting devices like phones. The information provided by the VR device can include not just the visual display but sound, touch (a controller rumbling, for instance), and smell and taste in advanced settings. While most current retail devices cannot be programmed to create scents or tastes, these features can be experienced in action at places like 4D theatres. Augmented reality devices are more diverse in design. Some AR devices are similar to wearable headsets, like the Google Glass glasses. AR commonly also uses cell phones to display layers onto the surrounding environment on its screen. In this case, phone or tablet apps are the actual AR interface, not the phone itself. Cameras can likewise superimpose layers onto the world as the user looks through the lens. Older AR systems often used computers as the interface between the real world and the augmented reality, but today computers tend to be used for VR instead. Like VR devices, AR devices and apps try to communicate with all of a user’s senses to create a believable experience, but sound and sight are the easiest information to communicate currently. Virtual reality is designed to be a completely immersive system. A VR device completely blocks out the user’s physical environment and generates a virtual display. For this reason, VR is especially good for media like video games or augmented movies, where the user would want to be completely focused on the content they’re viewing. However, VR is not integrated as subtly into the world as AR and breaks the user’s concentration. Like its name implies, augmented reality is not a completely separate environment. Instead, it is a layer on top of the user’s physical environment, and it generally depends on the features of the real world to properly express its content. An AR phone application may require a user to be standing near a historic landmark or a certain restaurant to see new information or artwork on their phone, for instance. AR is not intended to be as immersive as VR. Because virtual reality is an immersive system that typically uses computers or other powerful machines to render its environments, virtual reality media tends to be complex. Video games and movies are the most common forms of media adapted for virtual reality. These processes require a computer or console to display, and can be considered luxury products of their own. Augmented reality media is usually much less process-intensive than virtual reality. A phone or a detached headset can render the layers of an AR product. Since AR is meant to be a subtle addition to the physical world, AR media often takes the form of marketing campaigns or artwork. Campaigns like these can easily provide new layers of information to the user’s environment without requiring the processing power or user-end concentration of virtual reality devices. Virtual reality can be generated in several different ways depending on the media being displayed. Video games are often instantly rendered as the user plays, if a game engine is present, or they can be pre-rendered, in which case they are static and similar to a picture or movie. Some people also consider 360-degree videos to be virtual reality; these are completely pre-generated. 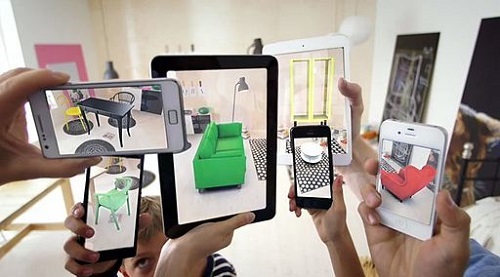 Augmented reality is often coded for phone apps, and renders reactively depending on the user’s location. It can be programmed similarly to virtual reality, but generally does not need an advanced engine to render. 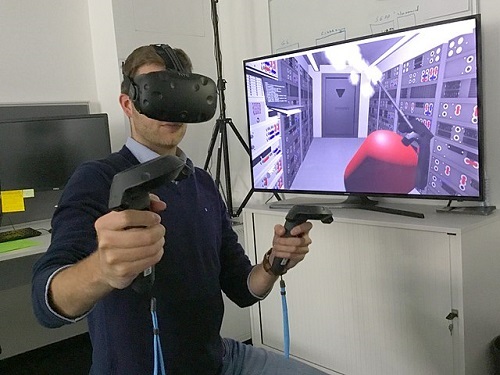 Although virtual reality can react to a user’s input during media like a video game, it does not, by definition, react to the physical environment. The VR world and the real world are separate and nonreactive, and the VR media is pre-programmed. Augmented reality has more potential to be reactive to the physical world than VR. Because AR is integrated into the user’s physical environment, any changes occurring live will also occur to the augmented reality layers. Augmented reality can react to the real world primarily through noting the user’s coordinates and changing its display accordingly; there’s potential for more reactions to be programmed into AR as the technology advances. Kelsey Robarts. "Differences Between Virtual Reality and Augmented Reality." DifferenceBetween.net. December 21, 2018 < http://www.differencebetween.net/technology/differences-between-virtual-reality-and-augmented-reality/ >.